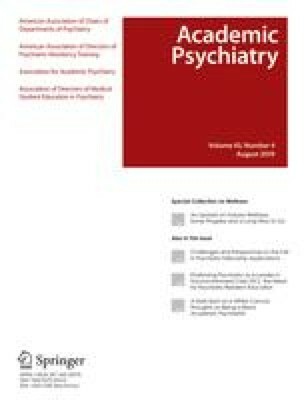 Manuscripts authored by an Editor of Academic Psychiatry or a member of its Editorial Board undergo the same editorial review process, including blinded, peer review, applied to all manuscripts. Additionally, the Editor is recused from any editorial decision making. The authors wish to acknowledge the recent passing of Dr. W. Sterling Edwards. This study was made possible by a grant from the Edwards Family Endowment for Communication Skills. The authors gratefully acknowledge support in the form of a Career Development Award (1KO2MH01918) from the NIMH to Dr. Laura Roberts and grant (R01DA013139-06) from the National Institute on Drug Abuse. The authors a so thank Josh Reiher and Krisy Edenharder for assistance in the preparation of this article.